The room was very clean and comfortable. All our needs were met with kindness and consideration. Excellant location. Eleftheria was a wonderful host. She was so accommodating to my whole family during our stay. We travelled as a family of 5 ( including 3 young children). She was so excited to share the history of Chania with my children and was gracious enough to give us an extremely late check out as we had a late flight back. We enjoyed our trip so much and wished we could stay longer. If ever we are back in Chania we would definitely stay here again! 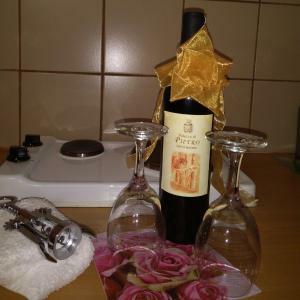 The location, the owner and her knowledge of the building and area, the accomodations, the air conditioner, and all the lovely little welcome goodies (wine, raki, fruit, coffee, tea, olive oil, and more)! A lovely historical property expertly maintained and managed. We were so pleased with this wonderful gem. Eleuthera (I hope I have the spelling right) was fantastic - so welcoming and helpful. She was especially helpful and kind about our keeping bikes in her lobby - we just loved her. Our room was stocked with drinks and fruit - comfortable and cosy. Other reviewers had mentioned noise from the street but our room was quiet! We loved it. Everyone was helpful and pleasant. Loved the availability to everything. Prime location. Close to the city center. Eleutheria is a kind wonderful host. Such a beautiful property with breathtaking views and an extremely romantic setting. Location, cleanliness, no hidden extra costs, hospitality of the hosts. The host family was as gracious and helpful as one can be. A delight! Lock in a great price for Palazzo di Pietro – rated 9.5 by recent guests! Palazzo di Pietro is conveniently located in the center of the old town of Chania and 150 feet from the Venetian Port. It offers traditionally furnished studios and apartments with free Wi-Fi access and has a roof garden. 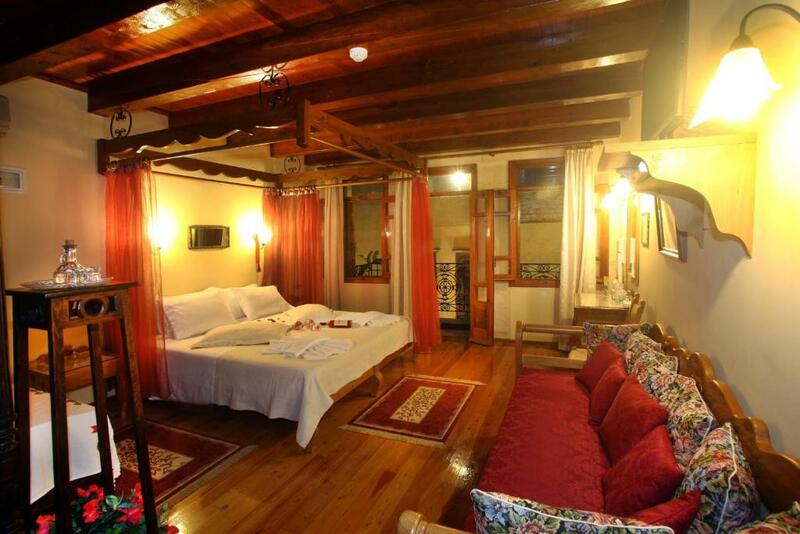 Studios and apartments at Pietro feature wooden floors and 4-poster beds with mosquito nets. They include a kitchenette equipped with electric kettle, mini fridge and toaster, and they also have a seating area with a flat-screen TV. Free toiletries and a hairdryer can be found in the private bathroom. Within proximity, you will find traditional restaurants serving Cretan specialties. Souda Port is 3.7 mi away, while Chania International Airport is at 7.5 mi. Free parking can be found near the premises. When would you like to stay at Palazzo di Pietro? Located on an ground floor, this air-conditioned studio features tiled floors and 4-poster beds with mosquito nets. It includes a well-equipped kitchenette with toaster, coffee machine and electric kettle. The seating area features handcrafted antique furniture and is fitted with a flat-screen TV. Its bathroom is stocked with a half-round bathtub. Free WiFi is provided. This split-level suite offers more space and enjoys views of Chania Town from its windows. It includes a well-equipped kitchenette, seating area with flat-screen TV and free Wi-Fi. Its elegant bathroom is stocked with a semi-round bathtub. 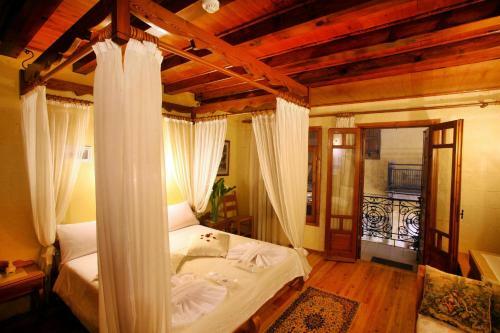 Decorated with handcrafted antique furniture, this deluxe room opens to a balcony. It includes a seating area with a flat-screen TV and a bathroom with semi-round bathtub. A fridge, a kettle and free WiFi are available. This small studio comes with a kitchenette corner with toaster, coffee machine and electric kettle, and a bathroom with hydromassage shower. 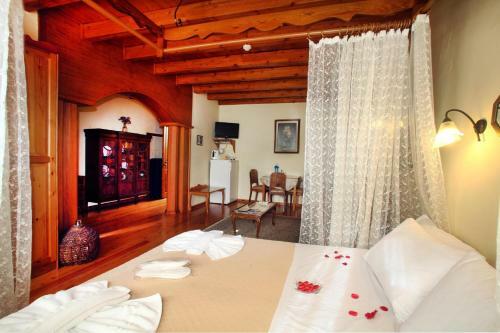 Air conditioning, a flat-screen TV with satellite channels, and free WiFi are available. Please note that this studio has no view. The window overlooks the interior of the building. Palazzo di Pietro is a small boutique hotel,it used to be our family house and it belongs to our family for centuries!We only have nine studios,each one is unique, with style and character,antiques and hand made furniture.Some of them have balcony and some others not,but we have a beautiful roof garden with so many flowers and panoramic view! Hello,I'm Eleutheria, the owner of this hotel,I'm a painter and art teacher for adult people.This is a small family run hotel ,Petros is my father,the hotel has his name because he did all the hard work to renovate the building.We try our best to have happy guests! The hotel is located at the centre of the old town,the area is pedestrian and quiet.Everything is on a walking distance from the hotel,so many restaurants,coffee places,even a well organized beach! House Rules Palazzo di Pietro takes special requests – add in the next step! Palazzo di Pietro accepts these cards and reserves the right to temporarily hold an amount prior to arrival. Should you wish to check-in before 09:00 or later than 23:30, kindly inform the property in advance. Please inform Palazzo di Pietro of your expected arrival time in advance. You can use the Special Requests box when booking, or contact the property directly using the contact details in your confirmation. Our hosts were the best! The daily cleaning service was excellent. We enjoyed extras such as fresh flowers and candies in the room. While completely modernized, this is a centuries old family home in the heart of Old Town. 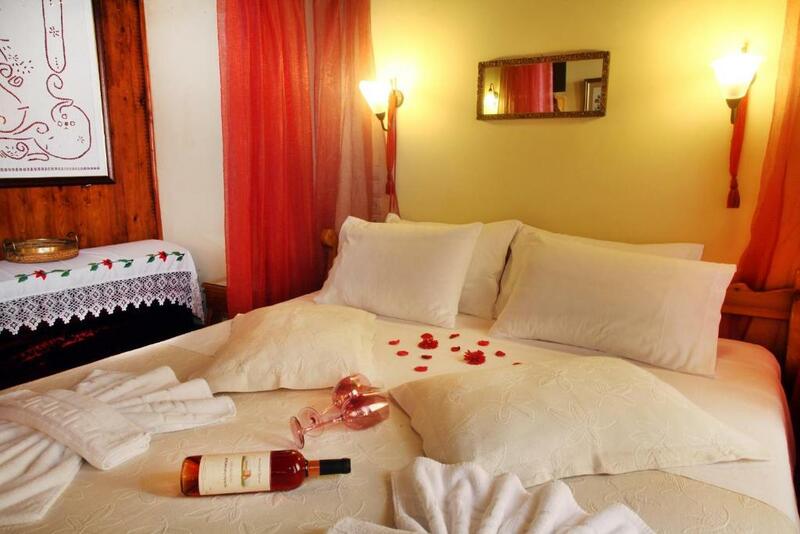 Family run hotel, wonderful touches in room such as fresh fruits, honey, daily chocolates. Extremely clean and great location. The lack of information about parking facilites outside the walls turned out to be a total nightmare on arrival. We should have been informed about this critical problem before. We learned on place that the studio is small and has no windows. I reserved having the room image in mind... I missed my meeting (18:00) with the owner by 20 minutes having spent more than 1 hour finding a place to park. As a result she was absent on arrival. Very dissapointing. There is no access by car within several hundred meters and you have to walk. The claim that there is free parking close by is false. We were pleased we had a ground floor room - stairs might have been a bit of a problem. Warmth, hospitality, and flexibility of the host was outstanding.